This is my first 3D painted / sculpted observational portrait drawn 100% freehand in Virtual Reality (VR) using the Oculus Rift VR system with Google Tilt Brush software. 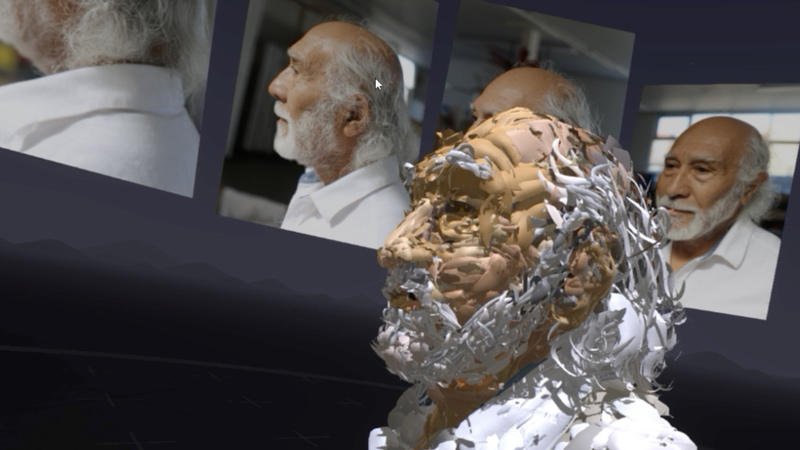 The portrait was created from scratch without use of any imported 3D scan or wireframe model. My visual reference was a series of photographs I took of my friend and fellow artist Gustavo Ramos Rivera, whose studio is also in the 1890 Bryant Building where my art studio is located. 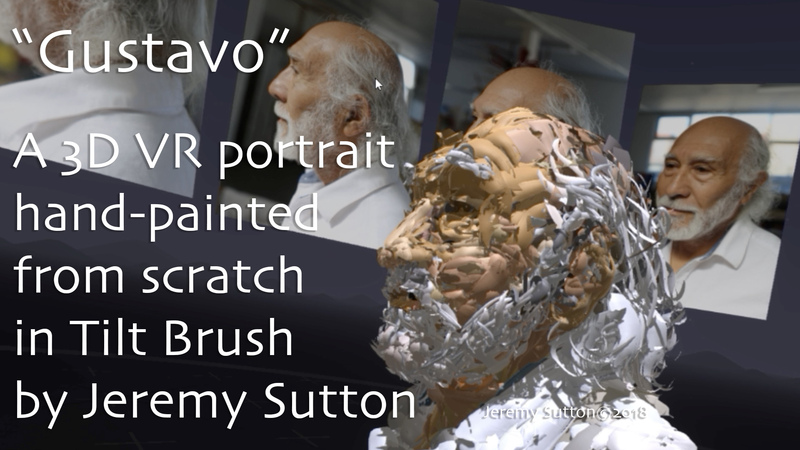 In the video below I share some of the creative process and you’ll see the brush stroke by brush stroke replay of the 3D portrait in the Tilt Brush environment. You’ll also see the very first brush stroke of the artwork, which I did live at the Fall Open Studios, November 11, 2017. …and here (below) is a short video showing my first ever 3D print based on this VR portrait, in fact my very first 3D print of any VR artwork. It is clearly a work in progress and still needs some “chipping away”!! 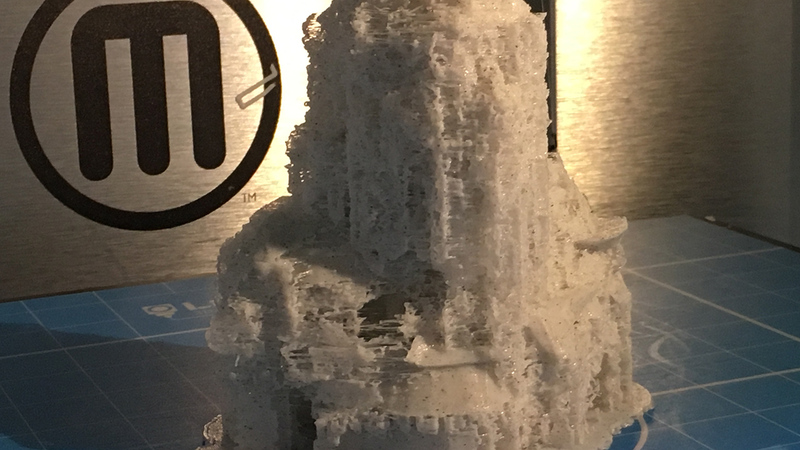 Many thanks to my studio neighbor, Diego, and to Imagination Supply Co, for kindly helping me with this first draft 3D print! Earlier I had painted a 2D portrait of Gustavo which you can see here. If you’re interested in experiencing VR painting for yourself, please check out the VR Art Experience. Great hands-on introduction to VR and Tilt Brush. Have fun making your own VR painting! Well done – what a clever idea- the leader of the next ‘gendre’.! Just back from a vacation in Panama. On the way back my companion had a movie with shapes and colors drifting and coalescing – what a way to paint and sculpt 3D with color and ? sound.—I was hooked. And of course ‘you’ the pioneer are already there.